To use an Auto Attendant you can begin building one if you have manager access to the portal. Once you are logged in, click the 'Auto Attendants' button. If you do not see this button and you are in a manager account, click 'Manage Organization' at the top right of the web page. Here you can add a new attendant or edit an existing one. Click the 'Add Attendant' button to the right. If you would like to edit an existing one, click the edit/pencil icon to the right of the Auto Attendant you would like to edit. First you must name your Auto Attendant and choose an extension. Be sure it is not an extension already in use or one that you will need as an employee's extension in the future. Next you are going to choose the routing for each option. Menu Prompt- This is where you will be adding your audio file/recording. Dial Pad Menu- This is where you will choose the routing for each option. Options Button- This is where you can choose what happens if an unprogrammed button is pressed or no button at all is pressed. 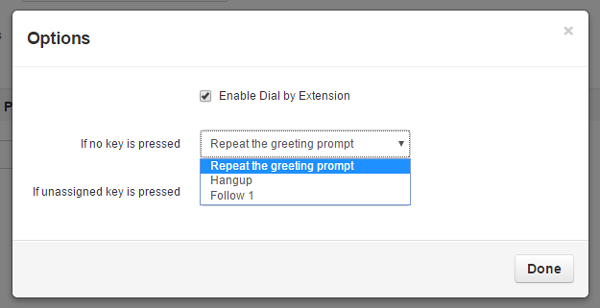 To upload or record your Auto Attendant Greeting, clock the megaphone button next to the Menu Prompt section. 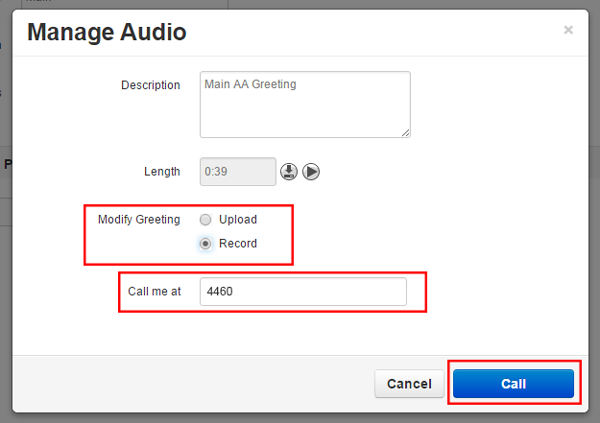 Here is where you can upload or record a greeting. First you need to name the greeting. If you are uploading a file, be sure that is its a .wav file. If you would like to record using your desk phone or cell phone, select 'record' and type in your extension number or cell phone number. Once you click 'Call' your phone will ring and ask you to record your greeting. You can hang up when you are done. It will then be uploaded into the Greetings. Next you will program the routing for each button option. Once you click an option, another menu will open up showing you all the options you can choose. 'Add Tier' will create a second AA menu, for example, if you had an option that lead to another menu, you would add another tier and program those options there. The last thing you will need to do is choose what will happen if the caller presses an unprogrammed button, or if they do not press any button at all. Once you are done, click 'Done' then review all your changes. If you think it is ready to go, click 'Save'.